We thank you for your understanding & assisting us with our commitment to road safety & the environment. 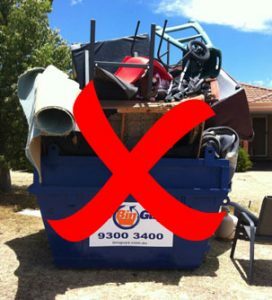 Load the bin evenly when the bin is picked up, transported & tipped the load does not tip the truck over. Load heaviest items at the bottom sand, rubble etc & lighter materials on top. This keeps a lower centre of gravity for road transport & tipping. DO NOT FILL PAST THE "HEAVY" LINE ON OUR 10 METRE BIN WITH SAND. The bins are engineered to take 12 tonnes (about the weight of 8 Holden Commodores). Overweight bins become a risk when lifting & transporting for everyone. The truck will not lift more than this & you will have to empty out the offending material so we can take your bin away. We also want our operators to go home to their families at night. Items such as asbestos, batteries, motor vehicle tyres, Liquid waste such as oil, paint, thinners etc, LPG Cylinders or gas bottles. Most Council waste facilities have free recycling of old paint & oil as well as LPG cylinders (or Kleenheat Gas will take for free). ALL GREENWASTE MUST BE PLACED ON TOP OF THE BIN (LAST ITEM TO GO IN). Greenwaste such as timber, palm & tree cuttings rot & break down to cause greenhouse gas's & future land subsidence. All of our bins (including our 2 metre bins) are fitted with a door for safe loading & easy access. If you are getting another quote, please check that your bin has a "door" in it. Many other companies quote with a "ramp" which is just a plank leaning on the side of the bin. Not only is this dangerous but poses Occupational Health & Safety issues for you, your employees & sub-contractors using the bin. Imagine wheeling a barrow of rubble up the ramp & falling off injuring your back - You become liable for the injury (OUCH). When filling the bin please consider the safety of our operators & other road users. 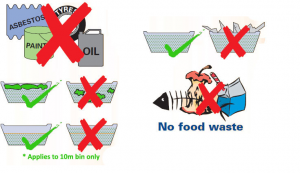 Please fill to the top of the bin & keep the waste fully within the bin. It is illegal to travel with a dangerous load on WA roads. We have a duty of care to our employees & also other road users. We are sure you would not like a truck to pass you on the road & a brick come off through your windscreen. Our operators also need to be safe if they have to break heavily & not worry about a length of timber sliding through the back window of the truck as well. Our operators also need to be safe from falling debris when the bins are loaded/unloaded so please keep the bin to a safe level for transport. All of our bins are "tarped" for transport to prevent material from spilling out whilst underway however a tarp cannot support large heavy objects from sliding out. Also the tarp is designed to cover the bin. If the bin is overloaded the tarp cannot do its job & the bin becomes dangerous to transport. Should our operators feel that any bin is unsafe to transport we will contact you to rectify the problem or if you are uncontactable the operator may unload the offending material from the skip bin. Please do not move the bin from where it is placed as it may be dangerous for the driver to pick up when the bin is full. For example, if there is a slope or there may be overhead powerlines or trees. Our trucks are 3.8 metres tall. Worksafe requires a safe working distance of 3 metres from all powerlines making a distance of 6.8 metres. Before ordering your bin please look up at the position where you would like it placed (it's easy you just tilt your head back & look!!) & see if there is any power lines or trees in the way. Moving the bins with a car or bobcat causes damage to the bin as well (bends the side so the door won't open or close). Please discuss your needs when booking the bin or with the driver on site when the bin is delivered to prevent additional charges being incurred. Please no dangerous goods in our bins!!! No Tyres, No liquid waste (Oil, Thinners, Paint etc) no explosives or flammable items (thinners, Paint etc) no asbestos ( if you are unsure please ask our driver & they will advise if you have asbestos or Hardifence/sheeting) no wet cement as this sticks to the bin & other rubbish making the bin dangerous to tip or jamming the bin with rubbish & cement. We invite you to jackhammer the bin out when this occurs!!!!! Thank you for your understanding & commitment to road safety. Other unacceptable hazardous items found within "your" bin will incur charges to the hirer at the prevailing rate. Should our operator find any of the above before picking up your bin we will contact you & allow an additional 48 hours to rectify the problem. Should you be unable to do so we will charge the hirer any additional costs passed on to ourselves above our standard rates. 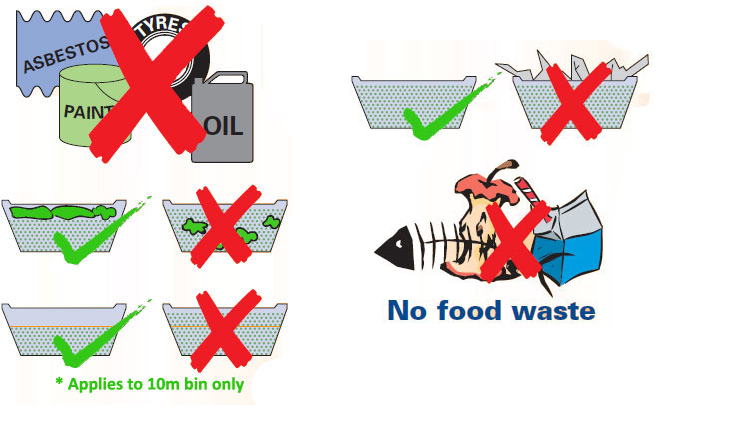 By accepting delivery of our bin, you agree to & acknowledge these conditions. We thank you once again for your understanding. For a quick response time when making a booking or requesting a quote please visit our bookings page.